Gibson and Epiphone are two of the oldest brands in the whole history of guitar production, especially when focusing on electrics. 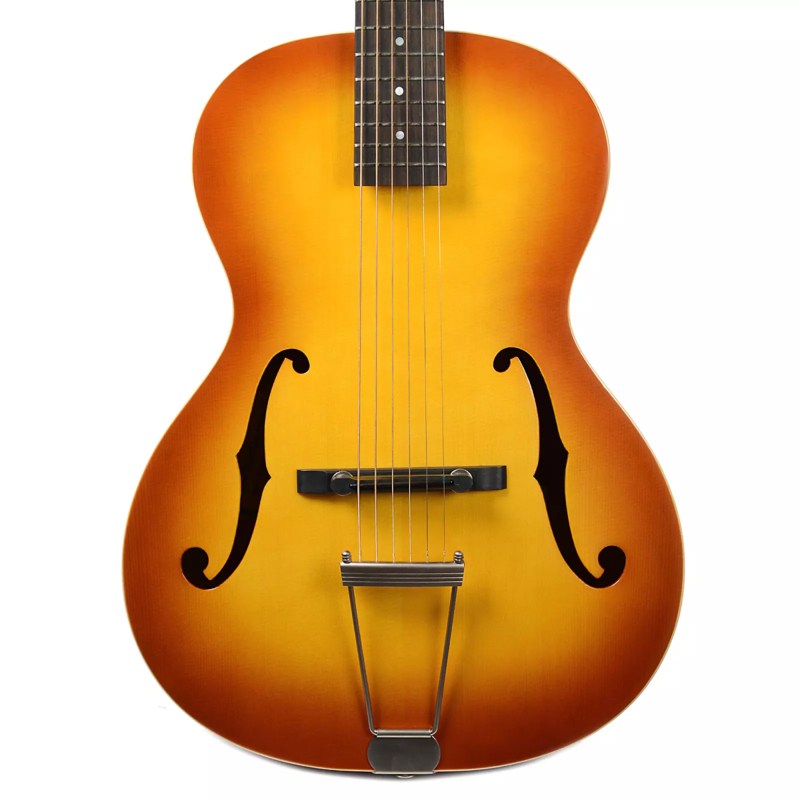 The two companies were competitors in the archtop market in the 1930s and during the development of the earliest electric models. In 1957, Gibson purchased Epiphone and used the brand as a way to broaden their distribution network and, eventually, to expand production beyond just the US. It's a long and entwined history, but for most modern players, Epiphone is seen first and foremost as the current low-end of the wider Gibson catalog. The split is considered to be cheap vs expensive, imported vs American-made, and at its core, budget-friendliness vs historic quality. The truth of the divide, though, is much more complex than a simple split between high- and low-end. According to most players, quality for both brands has fluctuated over the past decade or two, as have the exact specs and designs being brought to the table. With all that in mind, we thought we'd spend some time today trying to answer what makes Epiphone and Gibson different today. We’re attempting to look past players’ preconceptions and emotions, focusing instead on the objective issues of cost, components, selection, and value. Cost is a variable question, as the current most affordable Gibson, the M2, goes for $400, and the most expensive Epiphone, the 1965 Elitist Casino, goes for $2,000. Our best bet for getting at some consistent comparison, then, is to aim for the middle of the road and look at comparable models that a potential buyer might consider side-by-side. Here is a comparison of new models from 2018 that share essential design templates. These aren't all exact analogs, but are close enough to offer a meaningful comparison. Here, we're looking at brand new, advertised prices. The price difference is striking. It's worth noting that both Epiphone and Gibson guitars are readily available on the used market. Gibsons tend to retain their prices better, but there are also plenty of souped up, special edition Epiphone models that achieve prices closer to the Gibson range. Bottom Line: Epiphones are, of course, cheaper. But there's still a huge range of prices for instruments from both brands. For years, it seemed like Epiphone’s sole purpose was to market cheaper Les Pauls and SGs, along with its own core hollow and semi-hollowbody models, like the Casino. But over the past decade, the offerings have expanded into signature guitars, new designs not currently offered by Gibson, and a few totally fresh originals. On the acoustic front, for instance, Epiphone recently launched its archtop Masterbilt line that brought back many of the company's original acoustic jazz models. These models have no relation whatsoever to the Gibson company. For Gibson's part, their range of models has ebbed and flowed significantly in recent years, and the company has adopted the automobile industry strategy of totally revamping their lineup every fall. In 2015, for instance, Gibson introduced the much maligned range of robot-tuner affixed guitars, while the 2018 models announced just last month saw a significant paring back to focus on just core models. Bottom Line: There will never be a shortage of Les Pauls and other core models, but these days, Epiphone offers a ton of options you won't find with a Gibson logo. Wood selection as has always been a topic of discussion for in-the-know guitar people, and is becoming even more so following a series of updated CITES regulations this year. Gibson has been increasingly adding baked maple, granadillo, poplar, and basswood into its guitar and bass lines, especially following the controversial raid of its wood stock by the federal government in 2011. For any given type of wood — maple, for instance — there are very different species that grow in different locations. So even though Epiphone uses the same types of wood that Gibson does, the species are different, with Epiphone sourcing its wood from locations in proximity to its factories. In the case of maple and rosewood, the species used by the two companies are very similar. But mahogany, for example, is an entirely different story. Mahogany has many different species, and guitar companies that use “genuine mahogany” are quick to point it out in the literature — Gibson included. On the other hand, Epiphone (and many other makers) often employ sapele or luan — which are cheaper and more readily available while still in the mahogany family — and don’t call it out. In the past, Epiphone has also used alder and basswood for many models in place of Mahogany. Maple, too, has many varieties, but most important to this discussion are the grades and thicknesses of the wood. Gibson models use a carved maple cap for most Les Paul models, which is an important part of the tone and aesthetic. Epiphone generally uses a number of woods for its cap that are not always the same as the body wood. In most cases, though, Epiphone uses a very thin maple veneer. This is commonplace for many makers when employing flamed and figured maple, but Epiphone also uses this for plain maple tops. Gibson tends to use higher-grade woods and has recently been calling out the grade in model descriptions. Gibson and Epiphone both use a number of pieces of wood glued together to form the body of the instrument. Gibson typically limits this to two to three pieces, while Epiphones can be several more. 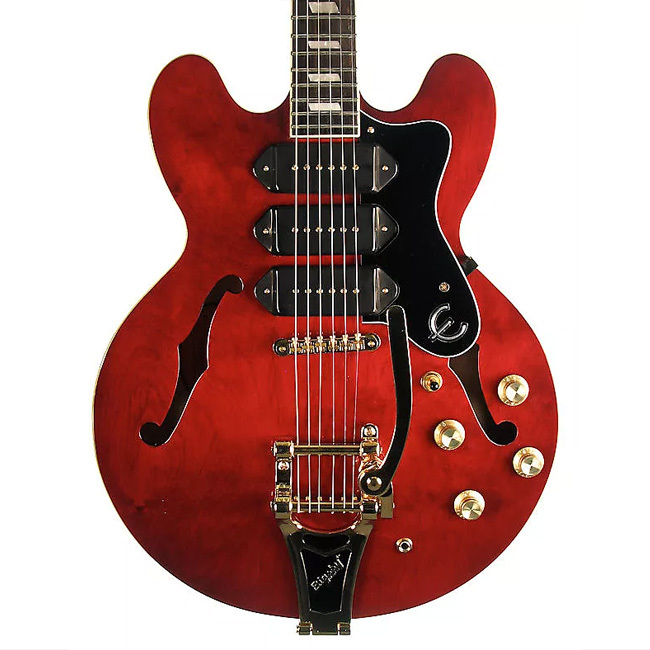 To disguise this, Epiphone almost always puts a solid veneer of the body wood on the back of the instrument, which is not typical of Gibson construction. Wood and construction differences also apply to electric archtops. Most Gibson ES models have a three-ply laminate of either maple-poplar-maple or maple-basswood-maple. Many Epiphone models, such as the Sheraton or Riviera, use a five-ply design. But this is not always the case. 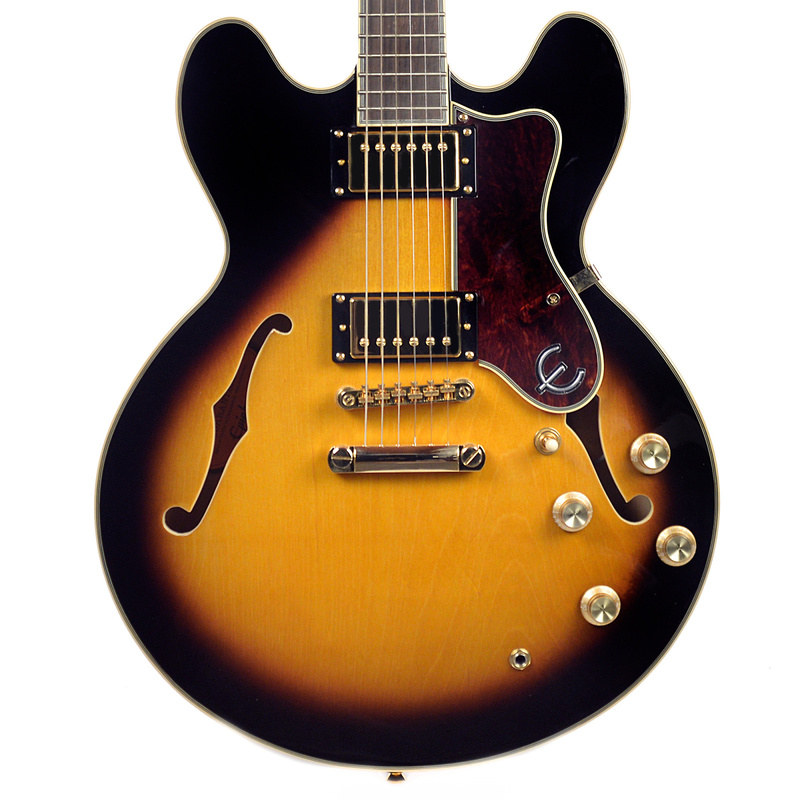 The Epiphone ES-175 Premium uses a three-ply body like Gibson. Many think the less plys used will encourage the instrument to vibrate more freely. What this means is subjective. If you are looking for the most accurate representation of the “Gibson sound,” these wood differences are things to keep in mind. At the same time, these mild difference do help keep the price of Epiphone models more affordable. Bottom Line: Gibson tends to use higher quality, traditional tonewoods, though has branched out significantly in recent years. Epiphone uses a variety of woods, often utilizing a higher number of thinner plys, but this is not always the case. Like everything else we've mentioned so far, hardware is widely variable within the product spreads of both brands. 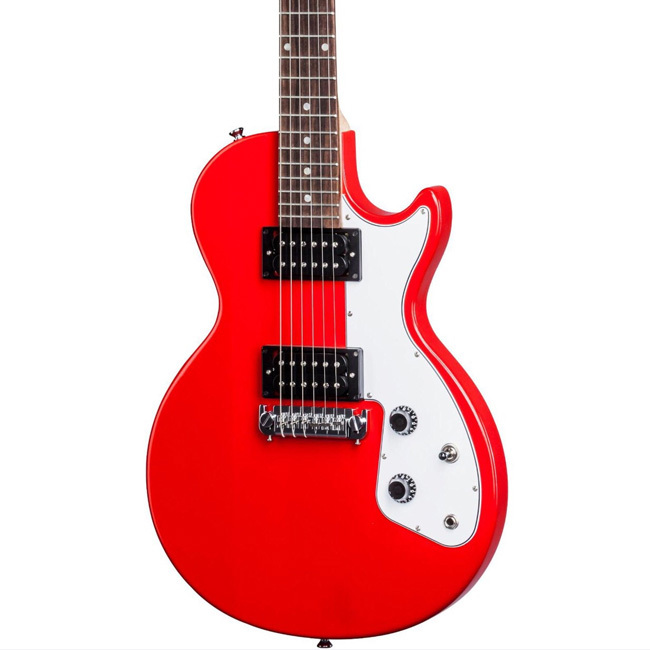 But generally speaking, the cheaper a guitar, the lower quality its hardware will be. Many top-end new Gibsons feature titanium saddles, and there is a wide range of hardware made in-house for Custom Shop and Historic models. Gibson also uses other hardware reportedly made by Ping, Gotoh, or TonePros. Gibson has also experimented with different metals. Many bridges are being made of aluminium now, but in recent years, most were made of an alloy called zamak. Epiphone has a similar process, but generally uses lower-end pieces — though does offer its own locking feature on many new bridges. While it would be easy to say that Gibson uses better parts overall, the low-end M2 and S-Series were much maligned for using very low-quality bridges that were nearly impossible to set with the neck angle of the guitar. 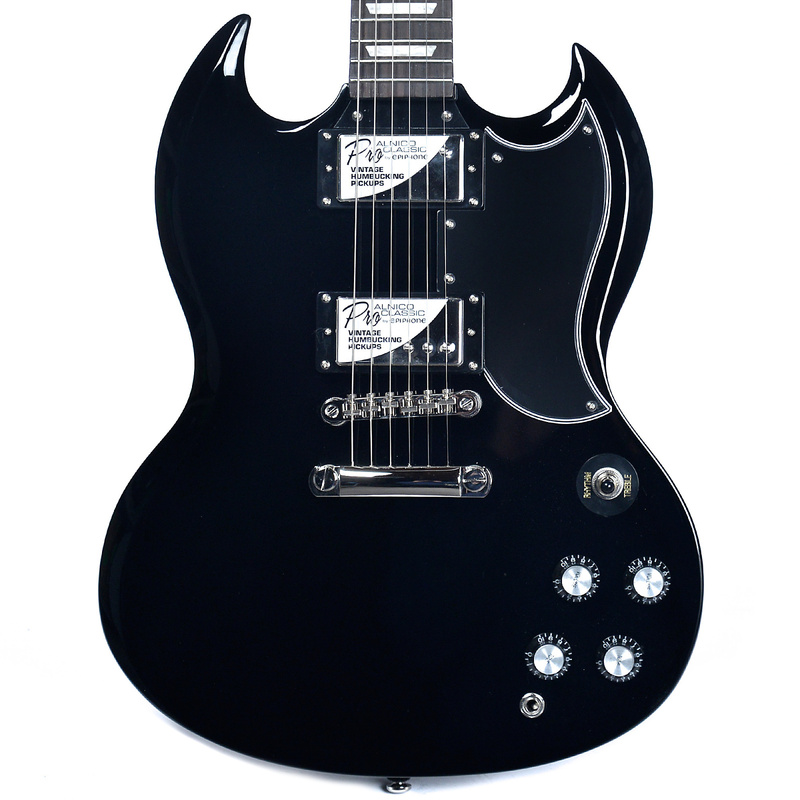 Many players also find the Gibson “Lightning Bar” bridge to be flawed, often requiring the installation of aftermarket locking studs. For other hardware, Gibson typically has used Corian-like composites for nuts, along with its metal zero-fret nuts. Epiphone uses plastic nuts that are generally not cut or and don’t fit as well as a Gibson nut. Both brands use various tuners, from self-branded to Grovers. Occasionally, Epiphone uses unbranded tuners, with sometimes dubious performance. Bottom Line: While there is certainly a range of hardware in use by both brands, Gibson guitars tend to employ higher-quality components. Just a few years ago, we could probably leave this section at “Gibsons use Gibson pickups, Epiphones use Epiphone pickups.” But now, things are more complicated. 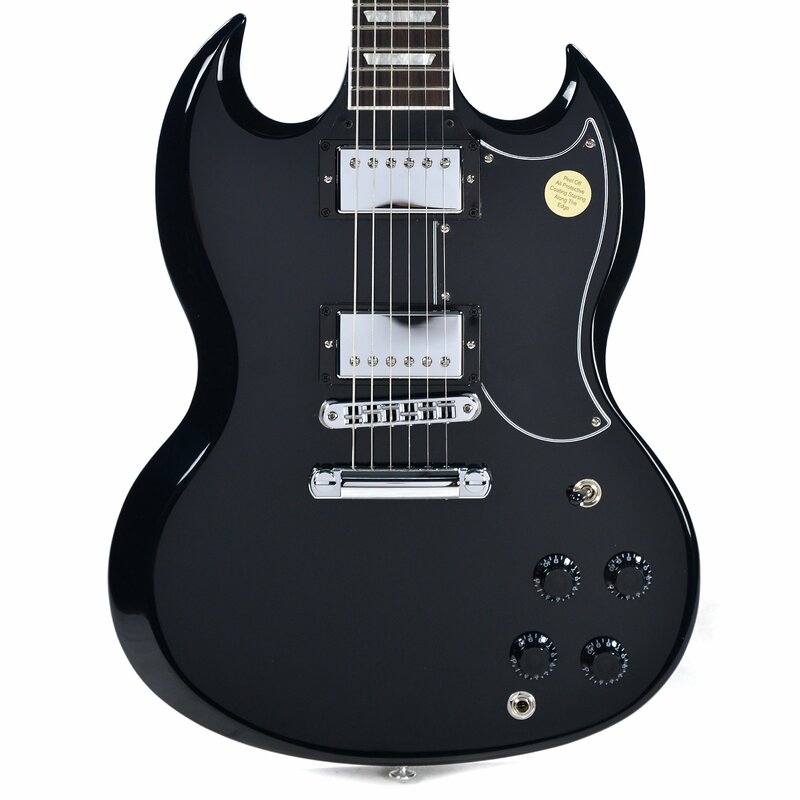 Many of the higher-end Epiphones — such as the ES-175 Premium — use Gibson USA pickups, while the ultra-affordable Gibson M2 uses Epiphone ProBuckers. Gibson has also recently been creating new pickups for its affordable models, such as the Firebird Zero and the S-Series. While these are still made in the US, some reviews have been lackluster, similar to the “Super 57” pickup released a few years ago. Epiphone also uses EMG pickups in a few models, as well as for guitars targeted to its metal audience. There are, of course, many Gibson-made pickups that have excellent reputations. The '57 Classics, BurstBuckers, Dirty Fingers, and other standard Gibson designs have all found their audience and are solid options for players considering upgrades to any guitar. It's important to note that pickups are easy to swap, and buying an Epiphone with the intention of upgrading to Gibson pickups is a common practice among savvy buyers. But it’s also worth noting that lower-end Epiphone models use inferior switches and potentiometers, which are prone to short and fail. Gibson has recently been converting to PC-mounted electronics, which has been unpopular with more traditional players, but ultimately, the change hasn’t been especially significant to most. Bottom Line: Gibsons will come stock with better pickups in most cases, but then again, pickups are easy to swap in and out. Like many brands, the quality of the fit and finish of a model is very dependent on price. I have personally owned a handful of Gibsons and Epiphones and can attest that this is true with these models as well. However, I’ve also found that two of the same guitar can have a wildly different finish and setup, considering humans are still in charge of these details. My personal experience is that middle to low-end Gibsons can sometimes have more quality control issues than high-end Epiphones. 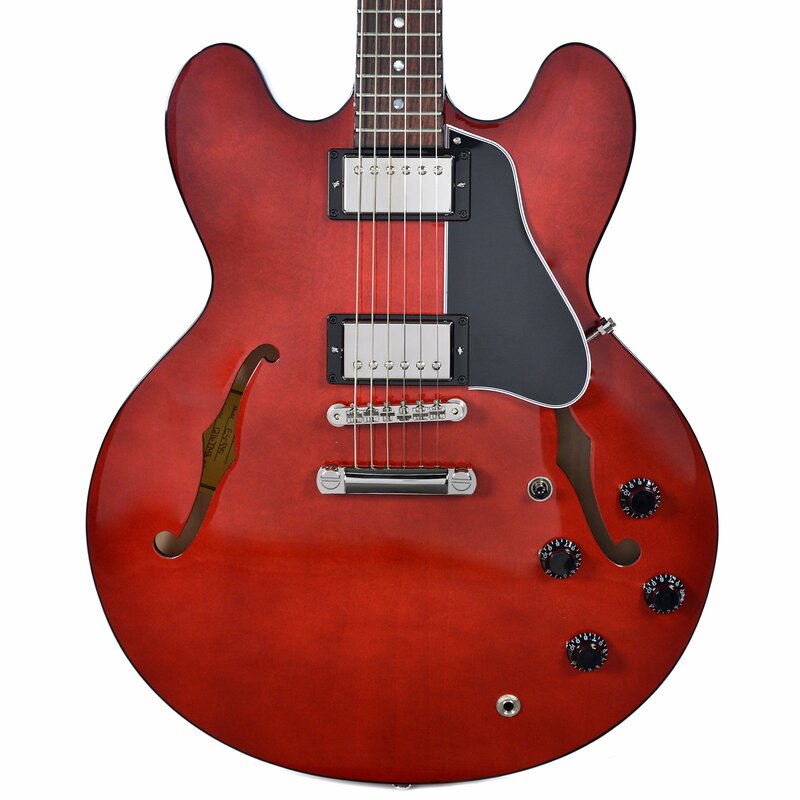 I recently ordered a new 2014 Gibson ES-335 studio, for example, that had some issues leftover from the factory. Meanwhile, my new-old-stock Epiphone ES-175 Premium arrived in flawless condition. This is just one personal example, though, and not necessarily representative of the brands as a whole. When it comes to fit, I find that Gibson has Epiphone beat in most cases. Gibson puts more detail into finishing their fret-ends and leveling and polishing frets. 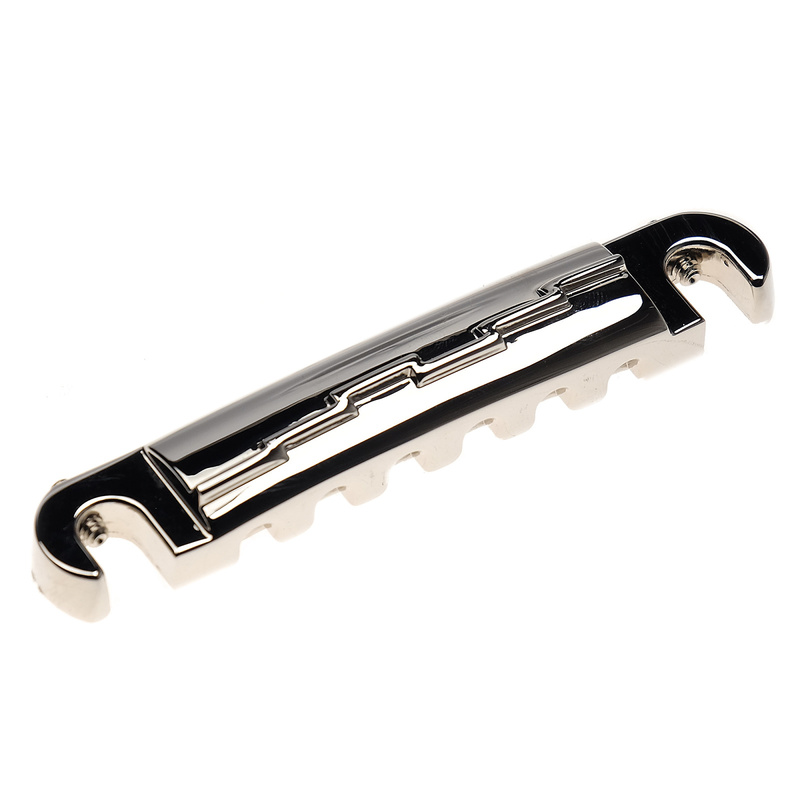 Epiphone usually simply clips and bevels its fret-ends, which can make for a less playable instrument. One of the most important parts of the fit discussion is the neck. 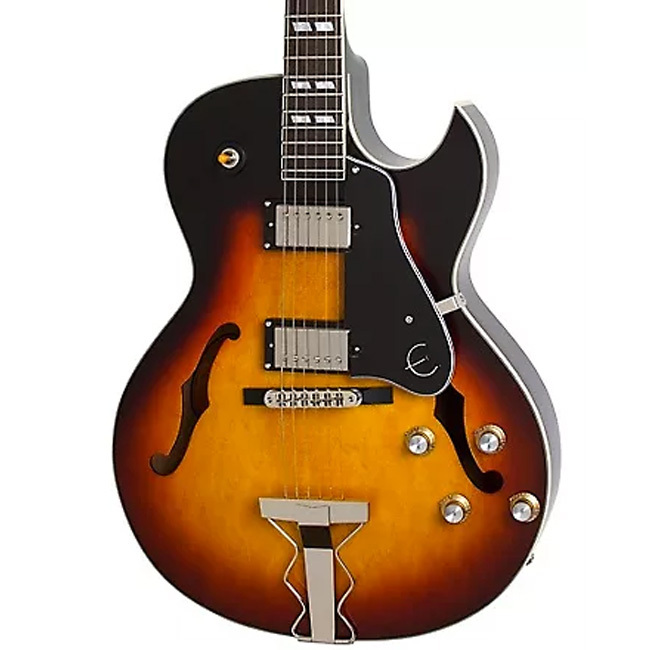 I’ve noticed that on many of the lower-end Epiphone semi-hollow models (ES-335, Rivera, Sheraton), the wood is unevenly carved on the sides of the neck to fit the pocket. I haven’t seen the same for Gibson, and Gibson’s necks are usually fit quite well. Also, Epiphone f-holes are generally a bit more rough that their Gibson equivalent. When it comes to finish, Gibson uses nitrocellulose while Epiphone uses polyurethane. It’s generally assumed that nitrocellulose sounds and ages better but is more fragile and prone to damage. Polyurethane, on the other hand, is extremely durable and impervious to most damage, but some players do find that it limits the vibration of the instrument. Bottom Line: When it comes to fit and finish, some of the differences in the details are objective and observable, but a lot of the differences come down to a matter of a taste and a player’s personal preference. Long-term cost is an important factor of guitar buying that often goes overlooked. While Gibson and Epiphone have different baseline price points, many buyers still buy a guitar with the intention of upgrading various elements — even when they’re buying something brand new. Gibson or Epiphone buyers often swap pickups, nuts, bridge studs and bridges, potentiometers, switches, and jacks. Some players dislike the new PC mounting system or have preferences for better-sounding pickups. And while this might seem like a lot of work to put into a new guitar, it really depends on what you, as a player, are looking for in an instrument. I have personally found that, in general, the higher quality materials allow Gibsons to age more gracefully. This gives longer life and better adjustability to parts like truss rods. On the other hand, since Epiphone uses a scarf joint for its headstocks, they suffer far fewer breaks than Gibsons — the possibility of which every new Gibson buyer should consider. Bottom Line: For players looking to upgrade the baseline instrument, the cost will be mostly the same. In the end, when comparing Gibson and Epiphone, typically the rule of “you get what you pay for” still applies. At the same time, the quality of Epiphones from their factories in China, Indonesia, and especially Korea has absolutely increased in recent years to the point that the lines between the two — especially in that $700-$1,000 price range — have definitely blurred. For any buyer, though, it is always best to follow your ear, hands, and gut, and seek an instrument that speaks to you regardless of what it says on the headstock.